Back again with a new Korean restaurant! This time, it's located in Sunway Mentari, right across Sunway Pyramid. Googling or Wazing there is fairly simple, just key in the name of the shop. 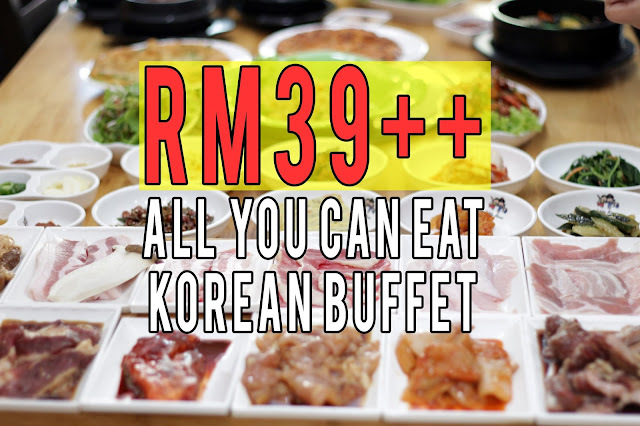 Korean Ala-Carte BBQ Buffet is definitely one of the key selling points here. Priced at only RM39++, it definitely is amongst the most affordable considering the options that they provide. Of course, like every other Korean restaurant, Banchan is what I would consider, the first impression. Depending on the quality and taste of their Korean side dishes, one can roughly grasp how good the restaurant truly is. Fortunately, Hwa Ga Korean Restaurant do not merely offer good banchan, but a wide variety of it as well. It's also refillable, so do go all out! The BBQ Pit, as expected, it's always messy! Packed with cutleries and stuff. So you might have to shift a little here and there. Before we dig into their buffet, here are some drinks that ARE NOT offered. You can definitely add them on the side and I'll personally recommend the Soju. I can't remember exactly what this is, but I do know it's fried chicken with enormous amounts of cheese! For those cheese lovers out there, this is definitely one worth going for. However, this is NOT AVAILABLE in their Ala-Carte Buffet! What I really admire about Hwa Ga Korean Restaurant is their attention to detail. Even roasting the bloody chicken, they'd rather do it themselves. Tender, juicy and packed with smoky aroma, this is fantastic for those who enjoys eating roasted chicken! Heck, even I pretty much liked it. Or you could opt for the one with cheese too! I'm pretty sure that this is the Dakgalbi, filled witch chicken, toppoki and veggies marinated in a spicy-sweet sauce. Tender to the touch and packed with a good amount of flavour. Or perhaps something a little more forgiving - traditional fried rice? Both these rices were alright, nothing too spectacular but definitely a good way to fill up your stomach. I wouldn't suggest all of you to go for it, but rather, just order one to share. Toppoki! Because it's necessary in every Korean meal. Despite it being a buffet, their range of stews were delicious! I personally enjoyed the Soybean Paste Stew with Beef, it's rich in flavour and goes incredibly well with rice. Though I'll advice to skip on the rice cause it'll make you full. Last but not least, the actual Korean BBQ itself. Pork, beef, chicken and squid! There are 11 different types of meat, cuts & marinate, so choose what's best for you. I personally like non-marinated pork belly & beef ribs, where I felt that their natural flavours were more profound. However, the most important aspect of any BBQ is the freshness of the meat, which I'm quite happy to say that Hwa Ga Korean Restaurant does possess. So no worries on that point, just enjoy! Definitely, definitely order the soju. I'll recommend the Pomegranate & Grapefruit! In conclusion, I enjoyed the place very much. The restaurant was kept clean and the service was great. Food were fantastic and the BBQ was memorable. So do I recommend this place? Absolutely! *PS: Special gift for every table too! *Maximum 2 hours dining time. *Special gift is subject to stock availability and T&C applies.